I don’t think the upgrade broke it. It doesn’t work in Firefox 3.0 or 3.5. The screenshot is actually from 3.0 although I verified it doesn’t work in 3.5 either and has the same result. From what their customer service said, it was pretty clear that they support IE only and this wasn’t a problem related to Firefox versions. Their first question was “Are you using Internet Explorer or Firefox?” When I replied Firefox, they said I had to use IE. What happens if you try to identify yourself as IE? Does it work at all or are they actually using some form of Microsoft plug-in? As you need to attempt an online purchase to test, I’m not really able to run tests on this in a practical way. Plus, I don’t want to identify myself as IE, that’s just a hassle to have to pick UA on a per site basis. Honestly these days I rarely run into sites that don’t work with Firefox. Surprising that HSBC is one of the few which don’t work. Thanks! Saved me some effort. I’ve been looking for an online savings account, and you’ve saved me the effort of having to really look at one of them. If you chat with them again, let them know they lost a potential customer because of their idiotic policy. It’d be interesting to know if this problem is specific to HSBC or if it lies with the company providing infrastructure for Verified by Visa. Many banks that issue credit cards are relying on third-party firms to handle Verified by Visa enrollment and verification, and the banks’ web sites call out to URLs at the third-party firms. Sounds like no support of “web standards” there, doesn’t it? And, not worth giving them our business, either. Maybe they need to be reminded just how many Firefox users there really are. 1) File a Tech Evangelism bug on this, please. And see if you can get to the bottom of who, exactly, is at fault here. I’m still not clear whether it’s Visa’s fault or HSBC’s, or some of both. I wouldn’t put it past either of them, but my gut says this is HSBC’s issue first and foremost. 2) Your animated rotating link colours are horrendously annoying. Joseph, this idiocy seems to be limited to HSBC Hong Kong. I have an HSBC US online savings account, and I can log in to that fine with Minefield right now (though there’s some unobtrusive text about it not being a supported browser which links to a support chart that lists Firefox as supported). What a lazy tech department! There is no way it’s not possible for them to make a version to work outside of IE. I hate, absolutely HATE, companies that cater only to IE. Annoying thing is, my debit card expires soon and the new one will be Visa -_- And I make a lot of online purchases. I don’t want to have to open up IE every time I want to make a purchase, and more than likely I’ll forget until the error occurs. I hope the case is, as Boris suggests, that it’s just HSBC Hong Kong. But for your sake I really hope enough people complain and they fix it! By the way, for what it’s worth, I like your rotating link colours! Gives me a retro feeling :). Sure, but if I’m opening an account, why risk it? I’ll just take my business elsewhere; there are plenty of choices. I’m the editor of Computerworld Hong Kong, and we will be addressing this in our magazine, possibly in print, possibly online, haven’t decided yet. I don’t understand why HSBC is backsliding…note that Safari is also now banned for VBV-transactions. 2) alternatively, tell them that you’re transferring your account to (another bank in HK, there are plenty) and ask to set up an appointment to do so. 3) if you’re not a customer, write/call/email (or all three). if calling, ask to speak to the credit card person and ask them to explain which browsers they support and why. 4) you can contact me with any feedback, just let me know if you want to remain anonymous if i use it in my reporting. i’m shammond (at) questexmediaasia (dot) com. Hong Kong business DO respond to pressure. but the pressure needs to be REAL. I cannot login to Hang Seng Bank (a member of the HSBC Group) with Firefox 3.5. I called technical support and walked through the entire login process to show her that this is definitely not working for me. Technical support suggested me to instead use Firefox 2.0 or IE 6 or IE7 for their e-Banking. I told her this is completely unacceptable as all these versions are deprecated and even if I were to have IE it would have been automatically updated to IE8. Is this only affects “verified by Visa” service? I just login HSBC eBanking services with Safari and Firefox. No problem. This is very rediculous actually, a global bank is only using one browser, shame on them. I think it is a right time for HK citizens who love open web stanards to give pressures to those HK enterprises who supports IE-only on their web customer services. I tried Firefox 3.5 and 3.0 with HSBC e-banking and stock-express, they work fine. Is it possible that it’s actually the problem with VISA instead of HSBC? I doubt its a problem with Visa as I have other Visa cards that work with VbV. 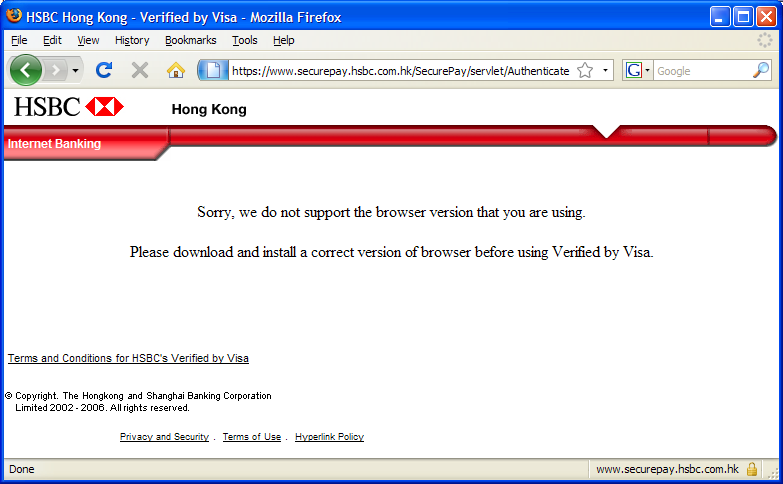 Also the VbV site for HSBC HK cards is run by HSBC itself and not a third party. That ain’t cool. Same happened with the e-tax system of the HK government, but they support firefox now, up to 3.0 only though.. I find it amazing, they just lost may be more than 30% of their customers suddenly. Wonder why their C.S. can told you only IE is supported? aebrahim: Can you tell us details of your case ? such as which OS and browser you using ? That is quite strange actually. If one is operating an online account then it doesn’t mean that he is a computer techie. There might be many people who don’t even know how to install a new browser, so it clearly leaves ‘do it yourself’ kinds of patches for those guys. Obviously on technical grounds, it doesn’t make sense either. Firefox version is also not a problem because it gives the same error in all Firefox versions. To be very frank, it doesn’t look like the browser is having any sort of problem; it is the problem with bank software. I have try firefox 3 and firefox 2 for online shopping and both failed, got the exactly the same message that your version of browser was not supported. I then use a visa card from another bank and the process finished without any problem. So it is most likely HSBC’s problem. I will try to file a complain email though it may be useless. I too had this problem and I’m from Sri Lanka.Im using Ubuntu and ff 3.5.3 .It was there when I had google tool bar installed.When i removed it VBV began to work and still does.I made a payment few weeks back. Moved to HSBC (Premier) because they were security leaders at the time (one of the first with one time pass key fobs). Leaving them now because they are security laggards. Every other major bank appears to support Firefox but not HSBC. This stops me using a linux boot disk for internet banking, which provides far greater security since with the more recent development of stealthy trojans like Zeus you should assume that any PC used for general browsing is compromised and you are probably not the only one controlling it. Typically a back door allows a greedy intruder to piggy back on your own valid banking session to makie their own transfers out of your accounts at the same time. This is not good enough and sooner or later will prove a major embarassment to HSBC when an wide scale incident occurs and they can’t offer their customers the easiest and safest solution of a trusted boot disk.